The tomatoes have arrived! It's the thing that was never going to happen, and yet it did. Miracle. If the other four tomatoes on this plant ripen, I'll consider it a bounty. I am tempted to curse these pathetic tomato plants, but have realized that they are already cursed. They're doing the best they can in Seattle, especially in a summer like this one. 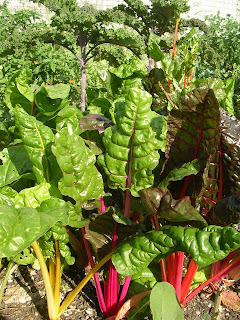 Planting them in the Northwest's maritime climate in the first place might qualify as something of a vegetable rights abuse. 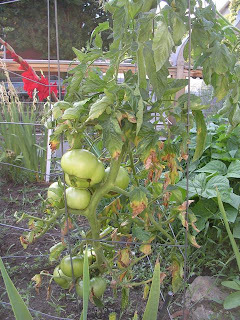 It's been a tough summer to be learning how to grow tomatoes. The ones in our p-patch languored for weeks before even starting to grow, and never developed much in the way of fruit. The ones in the raised bed at work took off like Jack's bean-stock, grew huge, developed tons of baby fruits, and then stayed exactly the same--lots of green bouncy-balls--for the last month. I've heard there's a bad tomato year for every good tomato year here, and that the good tomato years aren't really all that good. It seems that to have any success you have to expend a tremendous amount of energy. And yet we do. We are addicted to the summer-is-here look and feel of big, juicy, ripe red, gold, and yellow tomatoes. - If nothing else, snap off the suckers (the branchlets that sprout up in the "armpit" between branch and stalk). 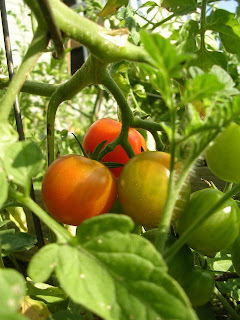 - Grow them in a well-ventilated greenhouse, or up against a wall with southern exposure, so they get the reflected heat. I tried less-extreme versions of pruning and snapping, but couldn't bring myself to use the cones. It seems so excessive. It makes me want to acknowledge that tomatoes are not a Northwest plant, and accept the aesthetic of lush chard fields and miniature kale trees as the sign of summer (and every other season) in Seattle. I am also averse to using plastic in the garden. I don't think of myself as old-fashioned, but I really like materials that can either be re-used indefinitely or that compost completely. This may some day include many more technologically-created materials than it currently does (read this book), and I consider myself forward-thinking in that, when plastics arrive at this point, I will be the first to embrace them. 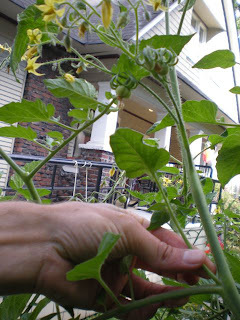 Still, I acknowledge that if I want to grow tomatoes in Seattle, I may need to compromise. But I'm holding out. Next year I'm trying this: I'm going to stack bricks on the northern side of the tomato plants, to absorb and reflect heat. I can re-use these year after year; take them down to turn the field and re-stack them. Maybe it'll work and maybe it won't, but it's better than giving up. I guess. "Hi, my name's Jack and I'm a berry-aholic." "The World in Your Garden"